Painting is mostly work, and partly magic. Most of the time when I paint, I feel a little at odds with what I am trying to achieve. Trying to make my hand do what my mind wants, trying to see deeper than a reference photo and capture a mood often feels like a foreign exercise. I fight with attempting to balance intuition and expression with design principles and colour theory, without feeling limited or boxed in. And every now and then, a painting comes together "like magic." Every stroke is a joy. There's a confidence about what I'm doing, and what is emerging on the paper, and these are the paintings that I am most proud of. This was the case with Waves Above the Wheat. Before the paint had dried on the paper, I knew it was a keeper. And then I posted a photo of it online, and people were not thrilled. I confess to being a bit of a like-counter on my Facebook page, and this one didn't seem to splash. In fact, I received a comment to the effect of it looking amateurish, and while in my head I understand that not everyone is going to like every painting, and people's tastes are subjective and varied, my confidence in the strength of the painting was shaken, so much so that I hesitated before entering it into a juried show. (I'm not one who believes in ignoring criticism if there is a chance it might be accurate, and it is easy for emotions to cloud an artist's assessment of her own work.) At the last minute I decided that I needed to enter the paintings of which I was most proud, and ignore the criticism, so I entered it. On Friday I received an acceptance email for the exhibition. 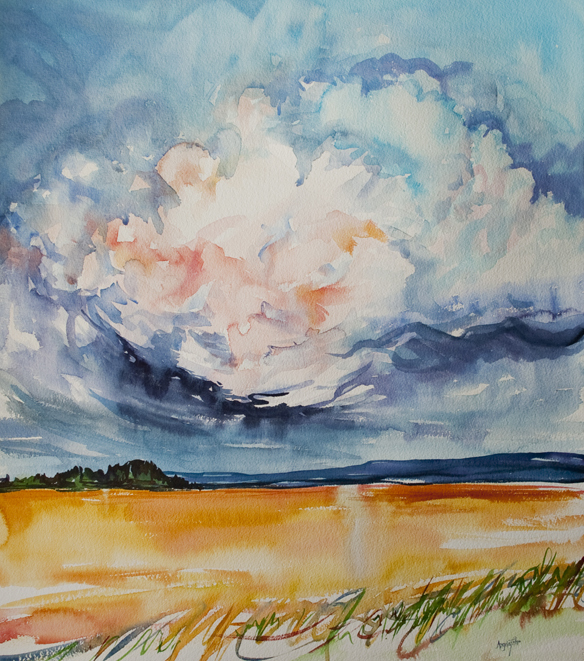 Two of the three paintings I submitted were accepted, one of them Waves Above the Wheat. And the acceptance email for the first time in my exhibition experience included juror comments. The comment for Waves read, "Daring composition that works well." You can just imagine how great that felt! I love this quote by Charles Horton Cooley: An artist cannot fail; it is a success to be one. Creating paintings that delight and satisfy me is a joy and a privilege. Getting sidetracked by a desire for praise and recognition is a dangerous obsession that can stifle the voice of the artist. I need to remember that the times when my most personal paintings are understood and celebrated feels more like success than a big red SOLD sticker.